Benzothiadiazole (BTD) has been extensively used as a building block in optical materials. In this work, a class of π-conjugated BTD-based luminogens BTD-685, BTD-580, BTD-675 and BTD-565 were designed by varying donor units and facilely synthesized by Heck coupling reaction. It was found that their emission in solid state covered the regio from orange, red to near infrared fluorescence. Investigation on photo-physical property manifested that they had strong solvatochromic behavior except symmetric 2-vinylpyridine substituted BTD-565. Crystal X-ray diffraction analysis revealed that they involved in multi weak intermolecular interactions. And loose molecular packing implied that they can be easily rearranged under external force stimuli. Indeed, all compounds showed reversible mechanically-responsive behavior in solid state. 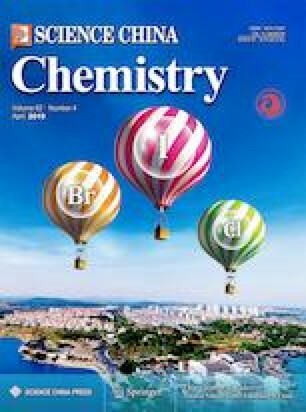 Interestingly, the vinylpyridine-containing BTD-565 exhibited hypochromatic mechanochromic behavior, whereas others showed bathochromic mechanochromism behavior. It was worth mentioning that BTD-675 had self-recovery behavior after grinding. The powder X-ray diffraction study showed that these chromic processes may be mainly attributed to the reversible morphological changes between crystalline and amorphous phase upon grinding or fuming. These observations suggested that the vinyl-functionalized benzothiadiazoles can be considered as a type of excellent candidates in mechanically-responsive chromic materials. Supplementary material is available for this article at https://doi.org/10.1007/s11426-018-9384-1 and is accessible for authorized users. This work was supported by the National Natural Science Foundation of China (21676113, 21402057, 21772054, 21472059, 21702079), Distinguished Young Scholar of Hubei Province (2018CFA079), Youth Chen-Guang Project of Wuhan (2016070204010098), the 111 Project (B17019), the Ministry-Province Jointly Constructed Base for State Key Lab-Shenzhen Key Laboratory of Chemical Biology (Shenzhen), the State Key Laboratory of Materials-Oriented Chemical Engineering (KL17-10), Open Project Fund of Key Laboratory of Natural Resources of Changbai Mountain & Functional Molecules (Yanbian University, NRFM201701), Ministry of Education, the foundation of Key Laboratory of Synthetic and Biological Colloids, Ministry of Education, Jiangnan University (JDSJ2017-07), and self-determined research funds of CCNU from the colleges’ basic research and operation of MOE (CCNU18TS012).